LIVERMORE — It’s no secret this area is known for great cabernet sauvignon and pinot noir, but wine isn’t the only red stuff being produced in abundance in this city. It turns out that more blood is collected each year in Livermore than in almost any other area locale. 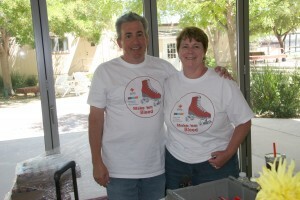 The community drive began in 2002, when Livermore resident Thomas Petty, now president of WSI Smart Solutions, was working at Chevron, which routinely sponsored company blood drives. When he left the company, he had trouble finding a convenient place to continue the donations. He eventually asked the American Red Cross if he could organize his own drive. Red Cross officials eventually asked Petty to join its board of directors for the Northern California region. He is currently chairman of that board. The Red Cross depends on frequent and multiple blood drives to collect the 300 units of blood needed each day at about 30 Bay Area hospitals, Red Cross spokeswoman Sara O’Brien said. Each unit of whole blood can be broken down into red blood cells, platelets and plasma. This means the 4,000-plus units collected in Livermore since 2002 likely helped almost 12,000 patients, including premature babies, cancer patients, trauma victims and those with bleeding disorders. The Red Cross relies heavily on drives at high schools and colleges, O’Brien said, but those sources, as well as drives held at businesses, tend to peter out during the summer vacation months. A routine drive as successful as Livermore’s is rare, as is a sponsor, or organizer, as committed as Petty. “As an example, we had 51 blood drives in July with churches all over the Bay Area,” O’Brien said. “Between them all, we collected almost 2,100 units. Tom — one person — has already put together 4,000 pints. Petty, who estimates he’s donated 80 pints of his own blood, tries to guarantee the success of the drives by constantly reminding potential donors of the need. Statistically, only 38 percent of the Bay Area’s population is eligible to donate, he said. Of that number, only about 3 percent actually donate. This means blood must often be imported from other areas of the country. Petty often partners with other groups to sponsor drives, including Team KC, a nonprofit dedicated to helping pediatric cancer patients. It was established in memory of Granada High School freshman Korrine Croghan, who died in 2008. She received many transfusions in her battle with choriocarcinoma. During that time, Croghan would send out pleas for blood donations to family and friends. While their donations may not have reached Korrine directly, they replenished the blood stock she was using. Petty hopes the regular Livermore blood drives will attract new donors. After all, he said, you never know when you’ll be the one needing the blood; Petty’s wife recently received 15 liters of plasma. “She’s my new poster child for blood donation,” Petty said.